My daughter is a professional photographer....I am SOOOOO proud of the work she does. Amy, my son Dan and I recently went to visit my son Aaron, lovely wife Rebecca and beautiful grandchildren Lachlan and Bridget. 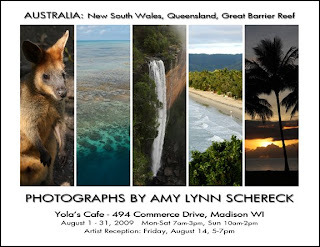 Amy took many photos, which will be displayed for the month of August at Yola's Cafe in Madison Wisconsin. I won't be able to attend, but she did promise photos. If anyone reading this blog lives in the Madison area....this is your invitation to visit the exhibit. Amy has a great website: http://www.amylynnschereck.com/ hope you visit the site. I'm off to craft with friends. I do hope I accomplish a finished project....I do know I will have a great time with great people.